You can't argue with the Oki ML3390 for its crystal clear printouts. In the long run your Oki ML3390 will run low on printer ink, and when that does happen you'll realise that replacing Oki ML3390 ink may be seriously expensive. Thankfully, however, you do not need to get stressed about paying the steep costs you'll get on the main street because right here at Cartridge Save you can find all the Oki ML 3390 cartridges you'll ever need at super competitive prices. Start to save cash on your ink by shopping online with Cartridge Save! Don't pay high prices on a ML-3390 original cartridge or ML3390 compatible ink down the high street when it is far more easy to save a pile of cash buying online with Cartridge Save. You have utter confidence by purchasing Microline ML3390 ink cartridges from us because every single one is guaranteed by a no quibbles money back guarantee. Don't forget to take into consideration that each purchase also comes with free delivery, usually arriving at your address the following business day! 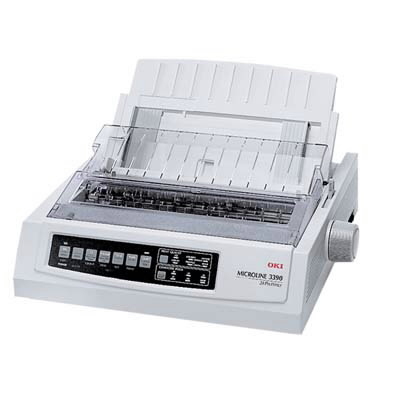 The Oki Microline ML3390 is a dot-matrix printer with a 24-pin head. It can handle a wide range of media including labels, cardstock, envelopes and continuous forms. Dot-matrix printers are ideal for accounting firms and the ML3390 Microline model is no exception. This type of printer is very reliable and can continuously print documents. The Oki Microline ML-3390 has been on the scene a long time and it is now considered a bit slow and outdated. Measuring 148 x 438 x 410 mm and weighing 7 kg, the Oki Microline ML3390 dot-matrix printer is very easy to fit in offices. This unit has a control panel with function buttons. The Oki ML3390 printer also has push tractors and single sheet feed. An optional ADF is offered too. The printhead has a life of 200 million characters while the ribbon lasts two to four million characters. For connectivity, parallel and USB 1.1 ports are offered. Print speed can go as fast as 333 cps on quick mode. The reliable Oki ML3390 Microline printer has a MTBF of 10,000 hours. Users can expect decent quality output from this unit. It has long-lasting consumables and it requires little maintenance. The Microline ML3390 24-pin dot-matrix printer is very easy to use and setup. It has the capability to print four pages at a time, one original and three copies and can continuously print media as long as 254 mm. Oki ML3390 Microline ribbons are affordably priced and easy to fit. Networking connectivity is not standard to the unit and only Ethernet is available. There are other dot-matrix printers that can deliver output faster than the Oki Microline ML3390 forms printer. The ML-3390 could be better if it also offered a hi speed USB 2.0 connectivity.